Here, we present a case of a 60-year-old male patient with inguinoscrotal bladder hernia and a bladder tumor who underwent cystoscopy and had no transurethral access. On the images, a massive inguinoscrotal hernia and a mass of 2.8 cm in diameter in the bladder were seen. First of all, hernia was repaired. Transurethral resection of the tumor was then performed. The tumor was in the posterior wall. High-grade T2 urothelial carcinoma was detected. The patient was offered radical surgery but he refused the operation. Multimodal therapy was recommended for the patient. Inguinoscrotal bladder hernia is a very rare condition (1). It usually causes scrotal swelling and lower urinary tract symptoms. In symptomatic patients, spontaneous urination following manual pressure over the hernia sac is typical of two-phase voiding (2). Most of the patients are male and the hernia is right-sided. Previous studies have reported that it was common in men aged 50-70 years (3). There is often a slight herniation towards the inguinal canal. Massive hernias in which the bladder is completely located in the scrotum are much less common. Treatment is surgical repair of the hernia. 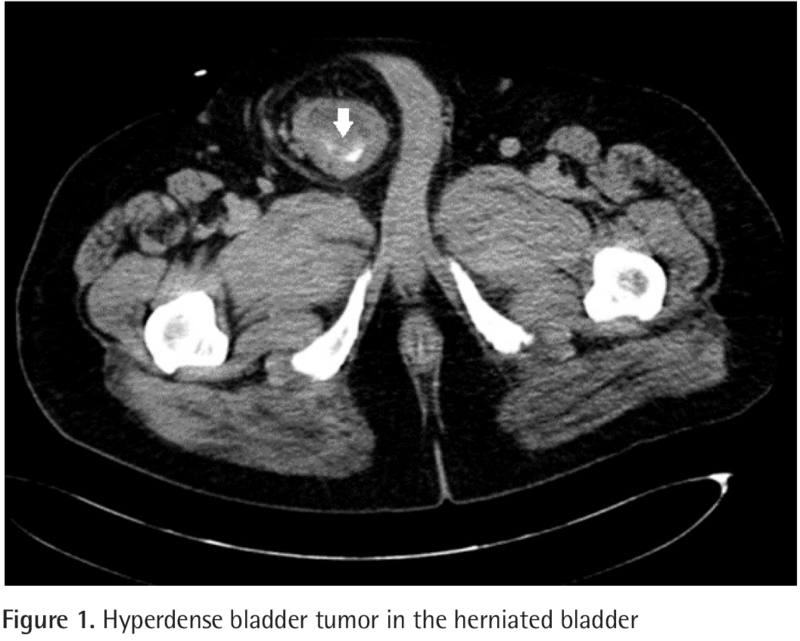 Cases in which tumors are detected in the herniated bladder are very rare. In the literature, only 15 cases of malignancy originating from the herniated bladder have been reported. We present the case of a 60-year-old male patient who underwent cystoscopy for hematuria and had no transurethral access. A 60-year-old male patient was admitted to our clinic with scrotal swelling and intermittent hematuria. Scrotal swelling was present for 3 years and hematuria for 1 year. Cystoscopy was intended to be performed in the external center, but transurethral access was not achieved. Blood tests were normal and the kidney function was not impaired. The patient had no irritative or obstructive lower urinary tract symptoms. However, the patient was describing a two-phase voiding. The uroflowmetry test was normal (Qmax: 16 mL/sec). Repeated measurements with transabdominal and transscrotal bladder scans did not detect residual urine after voiding. Residual urine control was also performed with a urethral catheter. The prostate could not be palpated by digital rectal examination. The urine culture was sterile and the prostate-specific antigen value was normal (0.476 ng/mL). An advanced inguinoscrotal vesical hernia was seen on abdominopelvic computed tomography (CT). The bladder was completely in the scrotal sac (Figure 1). The distal parts of the bilateral ureters and the prostate were seen to be pulled toward the inguinal canal (Figure 2). In addition, a 1.4 cm lesion on the lateral side of the right adrenal gland was observed on CT scan. There were several millimetric calculations and multiple cysts in both kidneys. A mass of 2.8 cm in diameter extending from the wall to lumen was seen in the bladder located in the scrotum. First, the bladder hernia was repaired. Transurethral resection of the tumor was then performed. It was determined that the bilateral kidneys were free of stones in the patient who had stone dropping after repair of the hernia. The pathology of the bladder tumor was reported as high grade T2 urothelial carcinoma. Radical cystectomy + urinary diversion were recommended for the patient. However, the patient refused the operation, stating that his complaints had receded after the repair. The tumor was located in the posterior wall of the bladder. Since partial cystectomy was not an option, the patient was then offered multimodal therapy. Various studies have reported that 1-3% of inguinal hernias were associated with herniation of the bladder (4). As it can be understood, most of the bladder hernias are mild hernias limited to the inguinal canal. Advanced cases, where the entire bladder is placed in the scrotum, is rather rare. Most cases are asymptomatic and diagnosed perioperatively (3). Some of them are diagnosed after the occurrence of postoperative complications. Very few are diagnosed with assessments of the symptoms. In our case, there were the complaints of scrotal swelling and hematuria related to the bladder tumor. Hernia is evaluated in three groups according to its relationship with the peritoneum (5). Paraperitoneal hernias, where the outer part of the herniated bladder is wrapped with the peritoneum, are the most frequent group. Hernias that are all covered with the peritoneum are called intraperitoneal hernia. Hernias unrelated to the peritoneum are defined as extraperitoneal. Our case was classified as extraperitoneal hernia at perioperative evaluation. Common etiologies of bladder hernia include obesity, pelvic wall failure, and bladder outlet obstruction (6). No evidence of other etiologies was found in the patient whose body mass index was 32 kg/m2. 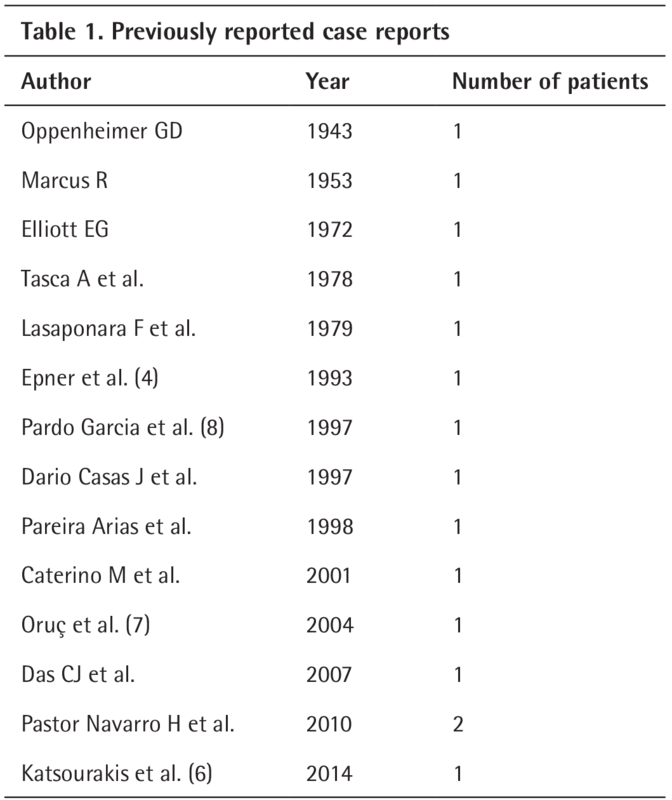 Most of the cases reported in the literature were asymptomatic. In our case, the patient was admitted due to macroscopic hematuria. In addition, other common symptoms, such as two-phase voiding and scrotal swelling, were also detected. Bladder diverticulum, mesenteric cyst hernia, hydrocele and spermatic cord cyst should be considered in the differential diagnosis (6). On ultrasonography, mild hydrocele in the right testis was observed. Hydrocele was thought to be due to bladder hernia, the ureters pulled toward the inguinal canal and cord pressure caused by the prostate. Oruç et al. (7) reported that 11.2% of 190 cases of inguinal hernia were associated with urological malignancy. The association of a massive inguinoscrotal bladder hernia and bladder tumor is very rare (Table 1). In fact, this patient, who also had mild hydrocele, benign adrenal mass, bilateral renal cyst and stones, is a unique case that has not been reported in the literature before. The main aims of the treatment are repair of the bladder hernia and endoscopic diagnosis and treatment of the tumor (6). However, there may be differences between the approaches of physicians. In 1993, Epner et al. (4) performed partial cystectomy for a tumor in a herniated bladder. In a case reported by Pardo Garcia et al. (8), bladder perforation and scrotal abscess occurred. Massive inguinoscrotal bladder hernia is a very rare condition. Its association with bladder tumor has been reported less frequently. The main purpose of the treatment should be endoscopic diagnosis and treatment of the tumor. Informed Consent: Patient’s approval was taken. Surgical and Medical Practices: O.Ö., Ç.D., Z.T., Concept: O.Ö., Design: Ç.D., Data Collection or Processing: O.Ö., U.A., Analysis or Interpretation: O.Ö., S.Ç., Literature Search: O.Ö., Writing: O.Ö., Ç.D. Bisharat M, O’Donnell ME, Thompson T, MacKenzie N, Kirkpatrick D, Spence RA, Lee J. 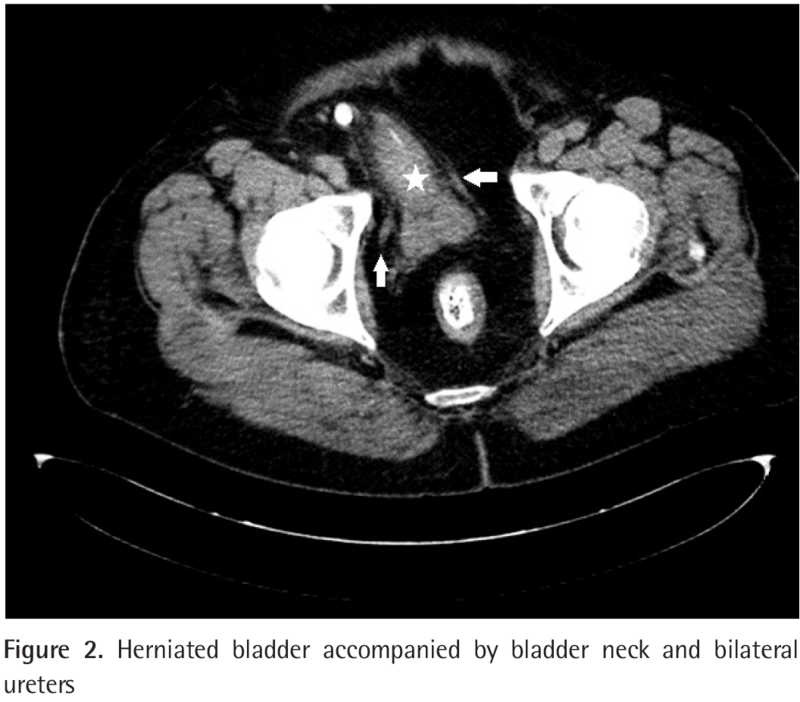 Complications of inguinoscrotal bladder hernias: a case series. Hernia 2009;13:81-84. Kraft KH, Sweeney S, Fink AS, Ritenour CW, Issa MM. Inguinoscrotal bladder hernias: report of a series and review of the literature. Can Urol Assoc J 2008;2:619-623. Kim KH, Kim MU, Jeong WJ, Lee YS, Kim KH, Park KK, Chung MS, Chung BH, Lee SH. Incidentally Detected Inguinoscrotal Bladder Hernia. Korean J Urol 2011;52:71-73. Epner SL, Rozenblit A, Gentile R. Direct inguinal hernia containing bladder carcinoma: CT demonstration. AJR Am J Roentgenol 1993;161:97-98. Gomella LG, Spires SM, Burton JM, Ram MD, Flanigan RC. The surgical implications of herniation of the urinary bladder. Arch Surg 1985;120:964-967. Katsourakis A, Noussios G, Svoronos C, Alatsakis M, Chatzitheoklitos E. Direct inguinal hernia containing bladder carcinoma: A case report and review of the literature. Int J Surg Case Rep 2014;5:180-182. Oruç MT, Akbulut Z, Özozan Ö, Coşkun F. Urological findings in inguinal hernias: A case report and review of the literature. Hernia 2004;8:76-79. Pardo Garcia JL, Perez Calvo J, Domingo Garcia P, Carrasco Gonzalez L, Gonzalez Pina B, Murcia Valcarcel A. [Occult bladder cancer in incarcerated inguinal hernia. Report of a case and review of the literature]. Arch Esp Urol 1997;50:1007-1009.